Do you currently know how many people click on links you use in emails, on your website or in ads you place elsewhere on the Internet? If you're sending emails to your list, you really do need to know how many people click on links in the email - in order to determine whether the ad was of interest to your subscribers - and whether your email copy was up to the job. For ads placed on your web site, you need to see how many visitors are clicking on the ads, to determine whether they could be improved. For ads placed elsewhere (on other sites or in other people's ezines), you need to know not only how good your ad is - but also how good that advertising source was, so you can decide whether to use it again. To do all this, you need a solution called "ad tracking". Ad tracking can be used to assess the effectiveness of ads you pay for, free ads, links in your own emails or links on your own website. By analyzing the results from an ad tracking system, you can substantially improve your income, by improving emails you send to your list, improving ads on your website - and by concentrating your marketing budget on your most effective advertising solutions. Despite these advantages though, there are many problems with most of the ad tracking solutions currently available on the Internet. They are generally expensive (costing up to $20 per month), difficult to use (requiring considerable time and effort to set up each ad tracker) and usually involve using long unattractive links that can actually reduce your response rates. They are also often rather limited, without essential features like sales tracking and automatic tracking of pay-per-click ads. Now I'd like to introduce you to a new ad tracking system that solves all these problems, providing you with a quick and easy, low cost, but very powerful solution. Lynx Tracker is a script installed on your own web site. Don't worry if you're nervous about the idea of installing scripts. The script is very easy to install and comes with comprehensive step-by-step instructions. You just need to fill in a form and the script will be set up for you automatically. Once Lynx Tracker is set up on your web site, there are no ongoing fees to pay. With many other ad tracking solutions costing up to $20 per month, Lynx Tracker can save you hundreds of dollars every year! One of the common problems with ad trackers is that they use links which can deter potential customers from clicking on them. The link below is typical of the sort of link used by many ad tracking systems. The first part of this link contains the web address of the ad tracking service, an address with which your visitors and newsletter subscribers may be unfamiliar. The second part is just plain obscure, just like those weird links often seen in spam emails. Independent tests have shown that many web site visitors and newsletter subscribers are reluctant to click on links like this. Now take a look at a typical link from Lynx Tracker (imagine your own web site address in place of mysite.com). The link has no obscure information in it and looks just like a normal link to your website. Tests have proven that links like this attract a much higher click-through rate because they look more trustworthy to your visitors and newsletter subscribers. Most ad tracker systems include a code automatically generated by the system in each tracking link. In both cases, you'll really struggle to remember which tracker is which. Lynx Tracker allows you to pick your own simple short name for each tracker. Choosing your own name makes the link look more user friendly than a system generated code. It also helps you remember the names of your tracking links, saving you valuable time by avoiding the need to look up codes each time you use a tracking link. Lynx Tracker is quick and easy to use. Next to each link, there are basic stats, showing the number of total and unique clicks and the number of associated sales (where appropriate), along with a set of buttons. As you can see, Lynx Tracker really is very quick and easy to use. If you are promoting a product and you want to put ads for it on different web pages - or maybe advertise in different ezines - you'll definitely want to know how many clicks come from each ad. You could just create separate tracking links for each ad - but you can do it much more easily using the "sub-campaign feature". Don't worry about the techie sounding name. A "sub-campaign" is just a name chosen by you, for each ad. You can use any names you want - it's just a way for you to identify the ads. Just pick a "sub-campaign name" for each ad and then add it to the end of your tracking link. All you need to do is make this small change to the tracking link and then use the resulting link in your ad. You don't need to "create" these sub-campaigns or let Lynx Tracker know about them in any way. The first time a visitor clicks on one of these links, Lynx Tracker will determine that it's a new sub-campaign name for which there is no record - and will then create a new sub-campaign for it automatically. Lynx Tracker will then automatically track all these sub-campaigns as part of the "ebook" tracking link. You can view the number of clicks for each sub-campaign separately - as well as seeing the total number of clicks for the "ebook" link. This feature makes it really easy to discover exactly which ads are generating a response. If you use Pay-Per-Click to directly promote your products, Lynx Tracker can tell you exactly what keywords are being used by visitors clicking on your Pay-Per-Click ad. This is easier than tracking keywords separately through your Pay-Per-Click account and it allows you track sales, so you can see how much money each keywords generates. In the Pay-Per-Click service (such as Google.com), just enter a Lynx Tracker tracking link as the URL to send traffic to. That's all you need to do. The script will then automatically track keywords from the search engine (this works for most search engines, including Google). Simply go to the Lynx Tracker admin feature at any time and it will show you a detailed summary of what keywords were used to find your site, which search engines they came from (in case you are using more than one Pay-Per-Click search engine) and how many visitors there were for each keyword/search engine combination. This is a very powerful and very easy way to track Pay-Per-Click campaigns to find out exactly what keywords are being used by your referrals. Knowing how many people click on each ad is valuable information. But it would be much more valuable if you knew exactly how many sales resulted from each ad - or from each pay-per-click keyword. With this information, you could instantly determine whether an ad or pay-per-click keyword was actually profitable. 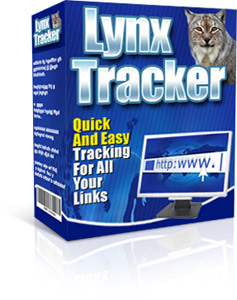 Lynx Tracker will track this information for you automatically. You need to make a small change to your download page (or "Thank You" page) for this to work (there is a special fully automated tool to do this). Once this is done, Lynx Tracker will automatically record the details of every sale, including the sub-campaign or keyword data that generated the sale. The software will optionally send you an email for each sale, with this information. You can also view the sales stats at any time for each of your tracking links. Click on the sub-campaigns button for a tracking link and Lynx Tracker will show you the number of sales for each sub-campaign. Click on the keywords button for a tracking link and Lynx Tracker will show you the number of sales for each pay-per-click keyword. This powerful solution allows you to discover exactly which ads are generating sales, so you can fine-tune your marketing efforts for maximum profits. Lynx Tracker allows you to monitor the performance of every single link you use. The quick and easy interface allows you to set up tracking in seconds and instantly check the performance of your links and ads at any time. Its powerful sub-campaign feature allows you to easily track every ad with minimal effort - with full sales tracking so you can instantly see how profitable each ad is. Its pay-per-click feature allows you to easily track pay-per-click campaigns - with full sales tracking so you can instantly see how profitable each keyword is. With all these features, this software could substantially boost your income. You might expect to pay a lot for this quality software. However if you order right now, you can get your own copy of Lynx Tracker for just $37. I expect a lot of demand for this superb software, so this low price could increase at any time without notice. This software is for use only on PCs running Microsoft Windows. The script requires a web host which supports PHP and SQL (most quality web hosts support these as standard). Although we provide powerful tools which can help boost income, the results are dependent on many factors outside our control, including of course the quality and nature of your traffic. We are not therefore able to give any guarantees about the level of income that you will attain by using this software. We will however happily refund your money in full in the unlikely event that you are unhappy with your purchase. Please note that this package is for your personal use only and does not carry any form of resale rights.